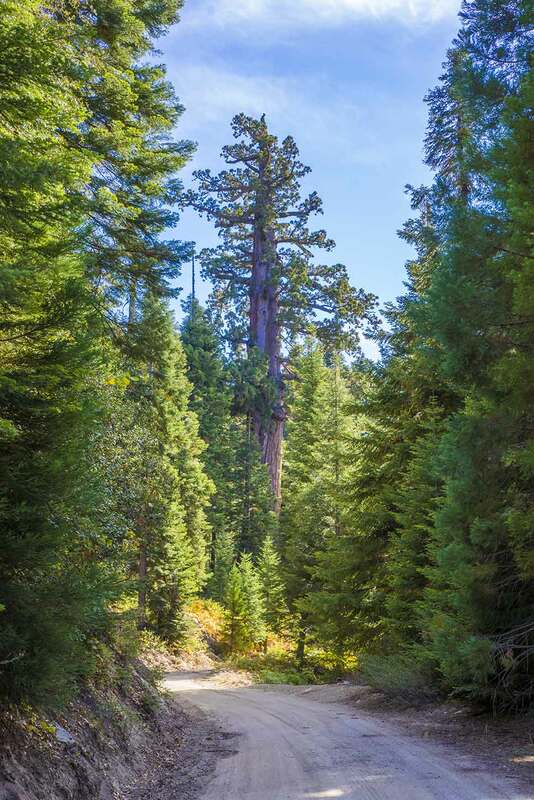 This difficult-to-reach grove is near the middle of a long dirt road that stretches from Camp Nelson to the Western Divide Highway near Long Ridge. 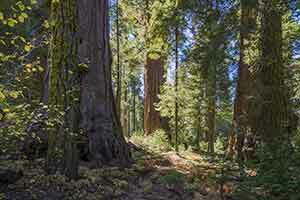 The sequoias in this grove are generally small and very widely scattered. 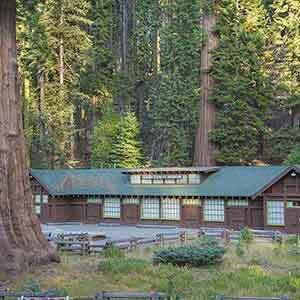 For example, although the main dirt road passes through the middle of the grove for a mile and a half, only seven sequoias can be seen next to the road. 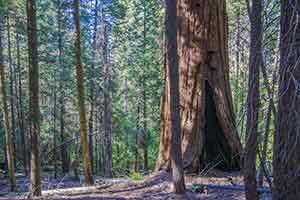 In fact, very little of the grove could really be called a sequoia forest. On the other hand, the grove escaped the 1980s clearcutting that affected most nearby groves, maybe because there weren’t enough really big trees to make it worthwhile. 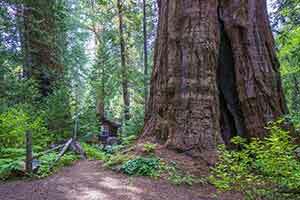 The grove’s most significant sight is a cluster of about a dozen huge, very old sequoias that can be reached by a hike on a deteriorating, non-drivable logging road. 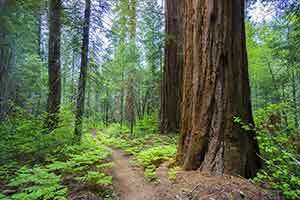 This is a hike for true sequoia fans only - for everyone else it’s not really worth the hours of driving and hiking to get there. The grove is on road 21S94, which is one of the better dirt roads in the National Monument. During the summer can generally be driven end-to-end in any car without trouble. 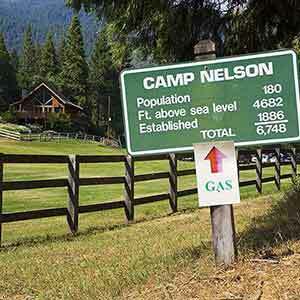 If coming from the north, the most direct route to the grove is from Camp Nelson. The road passes through the Tule River Indian Reservation and there are imposing "No Trespassing" signs at the boundaries. 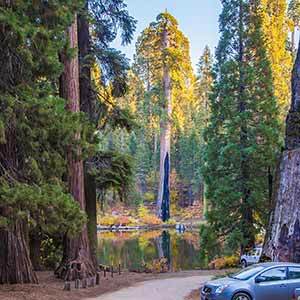 However, the Forest Service’s motor vehicle use map indicate that this is a drivable route and it appears to be a fairly popular off-road drive. 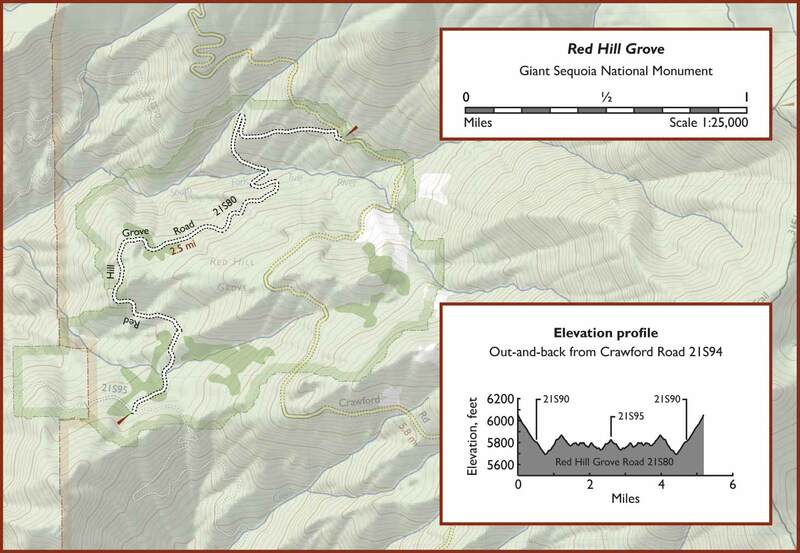 It’s about a 9 mile drive from Coy Flat Campground to the Red Hill Grove Road trailhead. From the south, drive north of the Western Divide Highway and look for a tiny sign that says "Windy Gap 3". 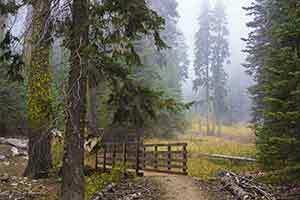 The trailhead is about 10 miles from the Western Divide Highway. 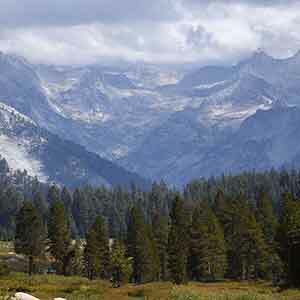 The hike starts about a quarter-mile north of the northernmost sequoia that can be seen from the main road. The old logging road is not marked. Especially if you’re coming from the north, it’s difficult to spot from the main road because it’s narrow and drops off down a slope, making it almost invisible. Fortunately, there aren’t many cross roads in this area. Although it’s too narrow for passenger cars and no tread marks are visible, the road is almost entirely clear of vegetation and fallen trees and is easy to hike. In 2011, a plan to make the road drivable was approved but apparently was never carried out. The entire route is wooded, although the woods alternate between dry regions with small trees and more attractive lusher areas with bigger trees. 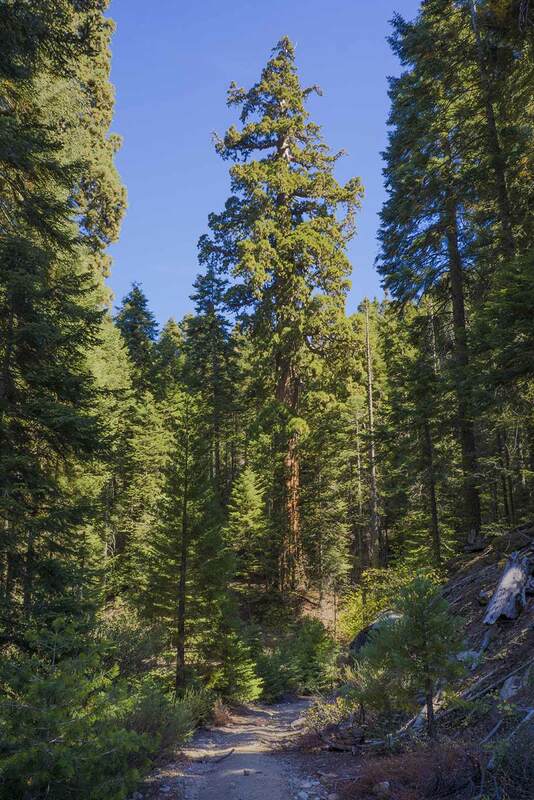 There are a few dozen small sequoias scattered along the road, particularly a few clusters in the lusher ravines. Overall the hike is pleasant if not particularly interesting. 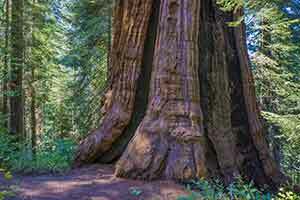 The destination is a cluster that clearly stands out by the sheer size of its trees. It’s located just before an intersection with a less-used dirt road. 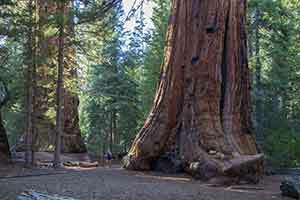 Perhaps a dozen immense trees stand in a cluster. Judging by their huge branches, the trees are very old. The logging road skirts around the edge of the cluster. 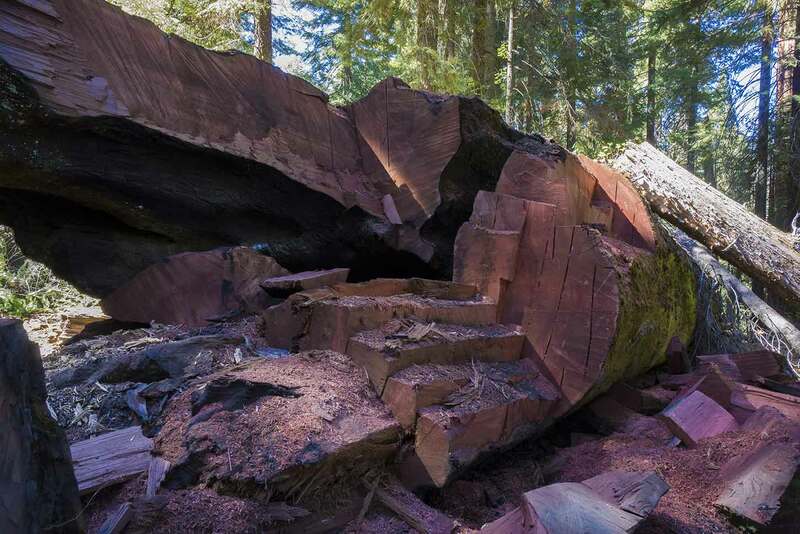 However, recently someone drove a pickup truck in here (coming from further up the road), cut down a few trees to make a track for their truck into the middle of the cluster, and carved up part of a huge fallen sequoia, making off with a significant amount of clear-grained old-growth sequoia wood, presumably for carvings. Ironically the best view of the cluster is from the track that they made. The fallen tree left a bit of an open spot where you’re surrounded by immense sequoias. 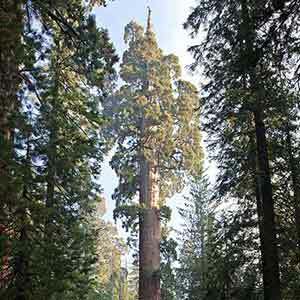 The road continues for a short distance past the cluster, passing a few more big outlier sequoias. 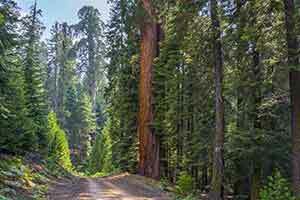 A less-used dirt road branches off to the left; a few yards up this road is a view of a big sequoia with a long, black scar that stretches along its entire trunk, presumably caused by lightning. 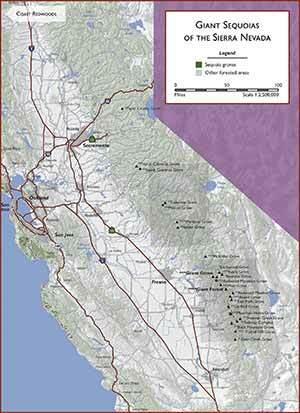 Returning to the main hiking route, it ends at a gate that marks the boundary of the Tule River reservation. The public isn’t allowed past this gate, but the road on the other side appears to be well-used by vehicles. The guidebook Backcountry Adventures Southern California has a description of road 21S94, which they call the “Windy Gap Trail” .